I received an inquiry about some murals I had created. I've painted around a dozen, some are gone now, and some are really not worth showing, but this past year I painted two and look forward to doing more. It's nice to go from gourds, which can be very tedious work, to a large scale mural. 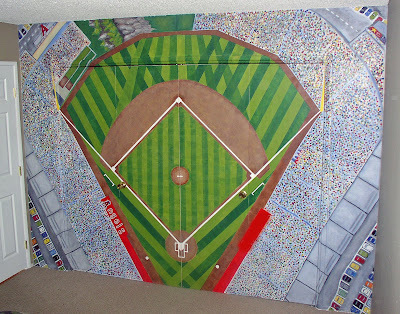 This first mural was created in a boy's bedroom. 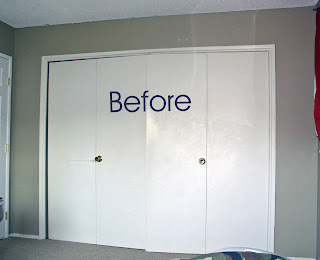 He wanted Angel's Stadium and the mom wanted to brighten up some plain closet doors. 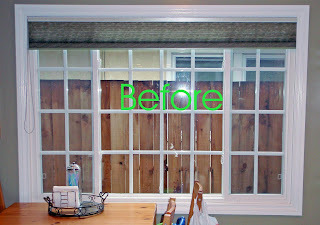 It turned out to be more difficult that what I expected but I learned a great deal, did things I'd never done before, and I sharpened my math and taping skills! The fun part was personalizing it as much as possible: the family, including the dog, is placed in the "dot" crowd and I was able to put myself in there as well which you can see as the icon for ABOUT ME. 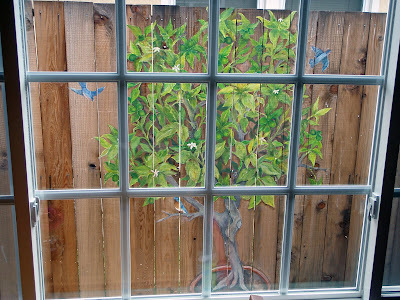 The second mural is of a potted lime tree with birds. She wanted something pretty to look at while sitting at the kitchen table and after some thought she decided on a lime tree. I was somewhat nervous because I would be painting on a wooden fence. If it's an interior wall I always have the option of painting over it, but in this case once I started there was no going back! This type of subject matter is a little more comfortable for me because I've painted leaves before and there's more "looseness" to the brushstroke which leads to more spontaneity... which for me equals fun...which hopefully translates to a good painting.